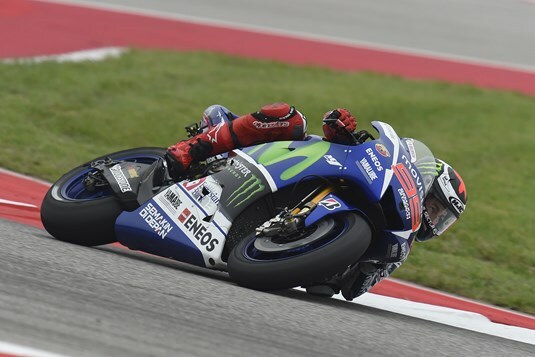 Movistar Yamaha MotoGP riders Jorge Lorenzo and Valentino Rossi secured third and fourth place respectively in qualifying this afternoon for tomorrow‘s Grand Prix of the Americas. With only 15 minutes to put in a hot lap at the long Circuit of The Americas (COTA), there was no time to waste for the Movistar Yamaha MotoGP teammates. Lorenzo was the first out of the box and took provisional pole with his first flying lap of 2‘03.505, before the field pushed him back down to sixth place. On his next lap he dropped under the 2‘03 mark with a 2‘02.927, moving up to second, before he returned to the pits for a new set of rubber. With five minutes left of the session he rejoined the track for a final time attack. Bettering his time through all sections he reclaimed the top spot with a 2‘02.540, before being pushed back to third, 0.405s from the front in the final seconds of the session. He will start tomorrow‘s race from the end of the first row. Teammate Rossi was also quick on the pace, with his first flying lap bettering his personal best to a 2‘03.170, momentarily taking pole before dropping down the order to fourth place. He had a wobble on his next lap, which cost him valuable time. He quickly headed back to his pit box for a fresh set of tyres with five and half minutes left on the clock. After a minute he came back out and picked up the pace even further, closing in to 0,033 from his teammate with a 2‘02.573. As he was unable to improve his starting position on the grid on his last lap, he will start his challenge tomorrow heading the second row. Pol Espargaro will commence his second Americas Grand Prix on the Yamaha YZR-M1 from the rear of the third row after undertaking a thorough qualifying effort today in Texas. The young Spaniard opened his Saturday account positively by finishing in 6th position in FP3, with a lap of 2’03.773. This performance saw him elevate instantly through to Q2 as the weather threatened rain which then failed to fall. Once the qualifying practice began, Espargaro launched into action and undertook 7 laps before setting a 2’03.161 on his last. Impressively, this time was a massive improvement of over seven tenths of a second from last year’s qualifying. After a positive weekend so far, the Monster Yamaha Tech3 Team rider will be seeking to battle to a strong result in tomorrow’s 21 lap dash in America. Meanwhile, Britain’s Bradley Smith will start round 2 of the MotoGP World Championship one place behind his teammate in 10th. The 23 year old began his day with a bright sprint to 5th position in FP3 with a top time of 2’03.666 which was a mere two hundredths of a second back from 3rd place. This left the British star confident of a successful Q2 campaign, yet unfortunately he experienced a technical issue on his MotoGP bike at the start of the session which forced him to make a pit stop and then change to his second Yamaha which was equipped with a used front tyre. Despite this, Smith pushed onwards before finishing with a best lap of 2’03.440. Tomorrow he will attempt to replicate his performance of last year at the Circuit Of The Americas, where he finished in 5th and as the leading Yamaha. Stefan Bradl finished very close to the pole in qualifying in the Open class at the Austin track for the Athinà Forward Racing team. After yesterday’s showers, today the weather has improved and, even if has stayed cloudy, both Athinà Forward Racing riders were able to better adapt to the challenging Texan track. Bradl, with a time of 2’04.275, finished just three tenths behind Barbera, first among the Open bikes. The German will start tomorrow from 14th position on the grid on the fifth row and is confident for the race where he will be fighting for victory in his class. Loris Baz also made one step forward. He posted a good 2’05.214 which earned him the twentieth position on the grid. For the Frenchman the goal remains the points-zone.